Get certified as Yoga Teacher!! Do you want to learn more about the art of Yoga eagerly? Want to share and spread knowledge and goodness of Yoga in the world? If you actually want to dedicate your life to Yoga and get continuously inspired throughout get, join our 200HR Yoga TTC at our yoga academy in Rishikesh India and get full of learning experiences and enlightenment for life. Yoga is about taking control and responsibility of your own complete being. It's about calming the fluctuations of a manic mind through breath, movement and meditation. Our well established course program takes you to different subjects including the philosophy behind Yoga (pranayama, mediation, asanas). In this way you will develop yourself on a spiritual, mental and physical level, giving you the confidence to take your Yoga practice to a deeper level and become a moving Yoga Teacher. "Yoga is the practice of quieting the mind." Patanjali. Next to this we are very proud to introduce you to our beloved family consisting of our highly qualified Indian team of teachers and our staff members. All teachers have a unique approach with a personal touch of love, paying attention for the group process but also meeting the student's personal needs. Our humble staff members will do everything in their power to make your stay as convenient as possible, making it feel as if you are home. The course has a duration of 4 weeks. Classes will be held from Monday till Saturday, with a half day on Thursday and an off day on Sunday. The full program can be found under ''Happy Yoga TTC schedule''. Ajarya stipulates regularly, continued hours to its teachers for their personal sadhana (practice). Ajarya has removed such teachers who deviate from this cardinal principle. 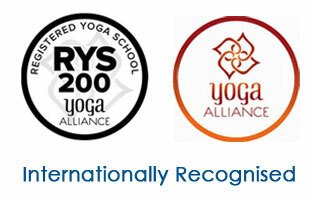 Ajarya ensures all its lead yoga teachers have atleast a Post Graduation Degree or Diploma in Yoga. All Ajarya teachers are encouraged to attend Continuing Yoga programs and refresher courses. Ajarya encourages its teachers to regularly communicate with their Gurus and Acharyas by asking them to participate in seminars and conferences. All Ajarya teachers must be present in all their sessions. If for any reason a teacher is absent, substitutes with more experience and knowledge take-over. Ajarya teachers build a standby team along with a main team for their courses. Ajarya has a progression plan for their teacher as detailed below in the Progression Plan! Ajarya encourages its Teachers to teach in other Teachers' Traning program where their experience can help many more. Ajarya also encourages its team of teachers to enrol for higher learning programs in Yoga!